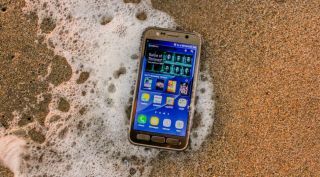 The still-unannounced Samsung Galaxy S8 Active hasn't exactly kept a low profile, but we now have more evidence to suggest the heavy-duty phone is indeed the real deal. A promotion from US carrier AT&T seemingly revealed the Galaxy S8 Active in its FAQ section, all but confirming the existence of the Samsung Galaxy S family's newest member, according to XDA Developers. The US-only deal offered $500 off a Samsung TV when switching to DirecTV with the purchase of a brand-new Samsung phone. However, the list of eligible devices originally included not just the Samsung Galaxy S8 and S8 Plus, but namechecked a "Galaxy S8 Active" as well. Since then, the posting has been edited to just include the S8 and S8 Plus, leading us to believe the announcement was made prematurely. It's still worth mentioning Samsung hasn't officially confirmed the Galaxy S8 Active yet. However, we have little reason to believe the tech giant isn't developing a rugged variant of its latest flagship series, leaks aside, since Samsung has made a habit of making one for a while now.